Weather – Again I sit here listening to the avian chorus. The predominate notes coming from Redbirds this morning. An occasional percussive note being introduced by a woodpecker here and there. I am waiting for the mockingbird (speak of the devil), there’s one now. I am beginning to hear crows and hawks in the distance. The sun hasn’t broken through the overcast yet, but we are setting on 60 already at 8:30am (I slept in this morning). I see it’s still winter on the the Blue Ridge and points north. From the weeks forecast on “Sunday Morning” all you folks in the northern tier of states need to hang onto the winter coats…Looks like another batch of winter heading south out of Canada at the end of the week. Sherpa Guides showcases an online collection of guidebooks produced by Lenz Design. Visitors to this Web site will find a wide range of information on historic resources, outdoor activities, and even lodging and restaurants. When the site is finished, there will be more than 3 million words, 1,000 maps, 1,000 illustrations, and much more. It could never happen today—469 miles of concrete coursing through mountainous wilderness, across two states, six congressional districts, 29 counties, 181 miles of national forests, and 11 miles of the Qualla Boundary Cherokee Indian Reservation. Today, red tape and paperwork would bury the project before the first shovel broke the ground. But when plans for the Blue Ridge Parkway took shape, times were hard. It was the Great Depression, and people needed work. Although the idea for a road through the southern Appalachians had been around as long as the automobile, the Great Depression gave it new purpose. The National Industrial Recovery Act of 1933 ordered the Public Works Administration (PWA) to develop a program involving the construction, maintenance, and improvement of public highways and parkways. During that same year, President Franklin D. Roosevelt visited the Skyline Drive, a Civilian Conservation Corps (CCC) project in Virginia’s Shenandoah National Park. When presented plans for a similar road connecting Shenandoah with the Great Smoky Mountains National Park, Roosevelt agreed. Later that year, Congress allocated $16.6 million for the project, and on September 11, 1935, officials broke ground on a 12-mile section at Cumberland Knob, just south of the Virginia/North Carolina border. The Blue Ridge Parkway was under way. For what it’s worth I highly recommend you spend some time exploring the areas covered by these books, virtually before you explore them in life. Photography – I have been posting a few photo’s of our NC vacations over at my Photoblog. I am very proud of some of these shots. Please take a moment and swing over…Here is a picture from the archive. 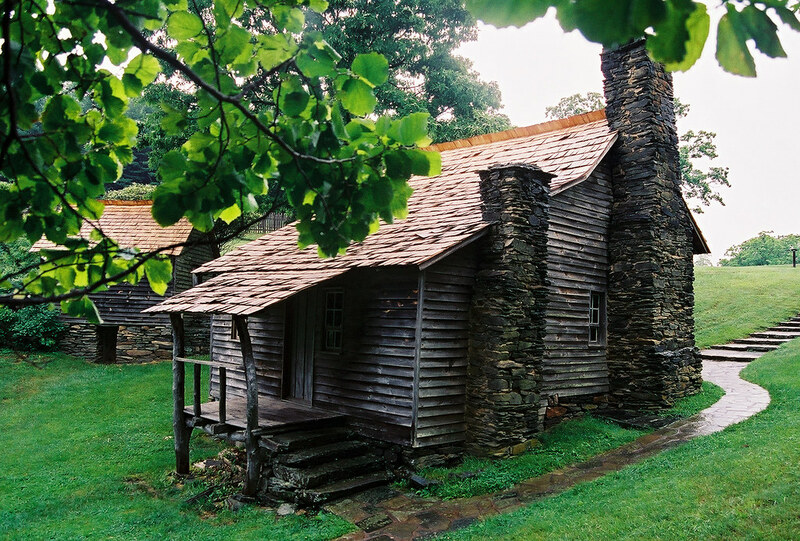 A cool, misty, rainy day on the Blue Ridge of North Carolina…a sturdy log cabin for shelter…a warm fire in the firepace. There’s a garden out back, planted with the seeds we saved from last year. There is a springhouse down below with milk from the cow fresh this very morning. The cow and her calf are in the pen out by the barn. Chickens and pigs or turning and scratching the fall garden plot. there is fresh butter being churned by the door. Momma is working on grannies loom, cloth for new clothes for the commin’ winter. The dogs are resting under the porch awaiting the next hunting trip into the woods up the hollow…Life is hard here on the Blue Ridge but really…what more could a family ask for? An original log home, built by Martin Brinegar (1856-1925) about 1880. He lived here until his death. His wife Caroline Joines Brinegar (1863-1943) lived here until the property was purchased by the government in the 1930’s. Both are buried in a tiny cemetery on a sunny knoll near the parkway. This post has had more hits than any other on any of my pages.